Everything we sell is unfinished. We don’t sell anything prefinished. Why do we install our flooring unfinished and then finish our floors onsite? Why not just put in prefinished? There are a few reasons why we have chosen to do things differently from just about every other company. Onsite finishing doesn’t require bevels and this is a wonderful thing that can’t be overstated. Prefinished hardwood flooring must have bevels, whether they are larger or smaller. Sometimes, they are called “micro bevels.” Aesthetically, bevels greatly compromise the look of hardwood flooring. Each and every board along the lengths and the ends is broken up by a bevel. Is that something desirable in a hardwood floor? Hardly. The bevel makes the flooring look like it came out of a box. By having bevels in between each board, the appearance is broken up by many lines created by the bevels. Essentially all hardwood flooring has a measure of sheen. With the bevels, this sheen is constantly broken up each time there is a bevel. This takes away from one of hardwood floorings best assets; the organic flow that hardwood flooring should have. Bevels are also dust and dirt magnets. Due to the depression in the boards at each bevel, a perfect dust and dirt ditch is created. Therefore, prefinished hardwood flooring requires more maintenance. No one likes bevels in a hardwood floor. They are unappealing, higher maintenance, and greatly take away from hardwood flooring. They are only there out of necessity. In a hardwood floor that is finished onsite, there are no bevels. None of the issues that exist from bevels in a prefinished floor are present in a floor that is finished onsite. With hardwood flooring that is finished onsite, it has more of a natural organic appearance. 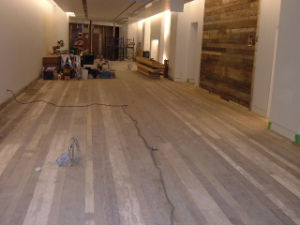 It is a more hands on process than prefinished flooring. It has that human element that can’t be achieved with prefinished box flooring. Just as homemade jam tastes better and is a more pleasurable experience to eat than factory produced jam, the same is true with hardwood flooring that is finished onsite. Onsite finished hardwood flooring always has a unique look. Due to the human element, each and every floor is authentic and bespoke. 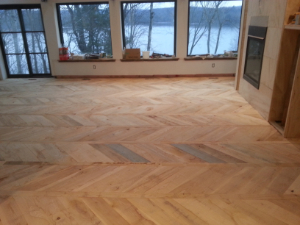 This is why we do onsite finishing of our unfinished wood flooring. It makes a difference everyone can see as they enter a space. Factory produced hardwood flooring looks like what it truly is; factory produced. We prefer to offer genuine hardwood flooring, made in Canada, that has an unparalleled appearance, feel, and has the ability to change the ambiance of a space. Onsite hardwood finishing allows for full customization. We are able to provide all sorts of hardwood flooring, from formal to rustic. We can tweak the flooring with stains, paint, texture, board sizes, patterns, sheen, among other variations too. Have you discovered hardwood flooring online through social media or other sources but have found it’s not available, it’s not exactly what you want, or the price doesn’t fit your budget? If this is the case, we can often manufacture, install, and finish the hardwood flooring for you, and give you what you want. That’s the advantage to finishing hardwood flooring onsite.